Many parallels are being drawn between business and biological organisms, business and ecology, business and chaos theory, business and ant hills, business and neurological nets, and other complex, adaptive, self-organizing systems. However, simply referencing the metaphorical links and then postulating a new business paradigm doesn't appear successful in communicating anything to people with operational concerns. Most business systems and most businesses are not ready for autonomous self-organization akin to that in nature, yet they must become more adaptable. I don't like using words like "ecology" to explain in shorthand the potentially rich and useful concept of self-organization. For one, these soft-edged metaphors turn off a lot of hard-edged business people who occupy a large portion of the organizational power structures - especially in operations and manufacturing where monthly shipping targets are expected to be met regardless of the circumstances. For another, nature has the patience and resilience to absorb a lot of failed or marginal experiments that would terminate a business enterprise. And besides, nature doesnt care who wins. akin to that in nature. Ten years of research indicates that a business-system structure consisting of reusable components reconfigurable in a scalable framework can be an effective base model for creating adaptable systems. The nature of the framework appears to be a critical factor. 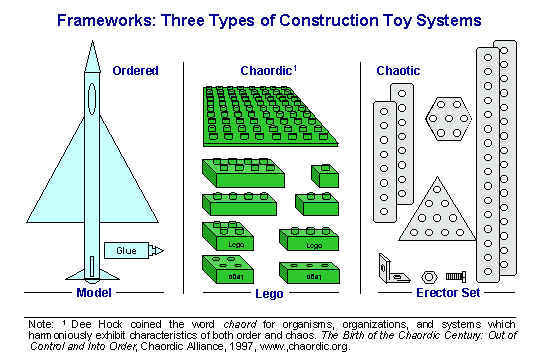 To illustrate this point and introduce the framework/component concept we will look at three different types of construction toys; making observations about how they are used in practice rather than what might be done with them in theory. Construction toys offer a good metaphor because the enterprise systems we are concerned with must be configured and re-configured constantly, precisely the objective of most, though not all, construction toys. I grew up in the age of the Erector Set. I watched my daughter grew up with Lego. Both dominated the construction-toy market of their eras (Legos era continues). Though my experience with Erector Set construction goes back to childhood, seeing one on someone's living room rug doesn't call for hands on action the way Lego does. You can build virtually anything over-and-over again with either; but there are fundamental differences in their structures that give them different dynamic characteristics. Both consist of a basic set of core construction components, and both have a structural framework enabling connectivity of the components into an unbounded variety of configurations. One popular Erector Set kit featured a picture of a 2-foot high Ferris wheel on the box cover. A current day collector/re-seller suggests on his web site that few people ever completed or even attempted this pictured construction, though the complexity was alluring. By (unfair) contrast, there have been massive whole-town reproductions made from Lego. Perhaps it is the tedium of using nuts and bolts to connect the construction components of Erector Set that inhibits large construction. Whatever the cause, Erector Set is not as scalable in practice as Lego. Modern day Erector Set kits can be purchased for constructing specific things, like a small airplane that can be assembled in many different configurations. Lego offers similar kits, and both toys include a few necessary special parts, like wheels and cowlings, to augment the core construction components. Watch a child work with either and you'll see the Lego construction undergoes constant metamorphosis, perhaps starting with one of the pictured configurations, but then being reconfigured into all manner of other imagined styles. With the Erector Set kit the first built model is likely to remain as first configured in any one play session. Erector Set, for all its modular structure, is just not as reconfigurable in practice as Lego. Lego components are plug compatible with each other, containing the connectivity framework as an integral feature of the component. A standard grid of bumps and cavities on external component surfaces allow them to snap together into a larger configuration. The Erector Set connectivity framework by contrast employs a special-purpose intermediate sub-system used solely to attach one part to another - a nut and bolt pair, and a 90 degree elbow. The components in the system all have many holes through which the bolts may pass when one component is connected to another. When a nut is lost a bolt is useless, and vice versa. When all the nuts and bolts remaining in a set have been used, any remaining construction components are useless, and vice versa. All the parts in a Lego set can always be used and reused, but Erector Set, for all its modularity, is not as reusable in practice as Lego. In contrast to both of these construction toys is the model-builders kit. You can get one of these for an airplane, too. The finished glued-construction, or maybe snapped-together, model will have a lot more esthetic appeal then the Lego or Erector Set versions; but what it is is what it will remain for all of time. The parts are not reusable, the construction cannot be reconfigured, and one intended size precludes any scalability. A highly integrated system, this construction kit offers maximum esthetic appeal for one-time construction use. The accompanying figure depicts the essential differences of all three kits. Complex adaptive systems theorists speak of the vibrancy and adaptability that exists between the borders of chaos and order. Too much order and nothing much happens in response to an environmental change. Too much chaos and nothing much happens with coherency and purpose. In our construction-toy examples the model-builders glued-together kit is highly ordered with a single purpose in mind. The Erector Set, with its nuts and bolts connectivity, allows connection to almost anything with a hole, while simultaneously making the connection/part-interaction process tedious - often resulting in many simple constructions with novel appendages - chaos is the result. Lego walks between, accommodating the moment-to-moment whim and imagination of the user with a readily adaptable system. The model building kit has a tight framework: a precise construction sequence, no part interchangeability, and is highly integrated. Erector Set has a lose framework that doesn't encourage interaction among parts, and insufficiently discriminates among compatible parts. Each component in the Lego system carries all it needs to interact with other components, and the interaction framework rejects most unintended parts. These construction toys are all "good" systems. But Lego is the more adaptable. Lego is also the dominant construction toy of choice among our pre-teen builders - who appear to value experimentation and innovation. Fixed frameworks, no matter how enlightened, will become obsolete with time, and restrict the applicability of systems they are meant to enable. Frameworks must evolve. Part of the success of the Lego toy is due to a good initial framework design that required virtually no evolution for many years. Recently, however, someone at Lego saw fit to incorporate changes that brought motion and computer-programmed microprocessor control to Lego constructions, a move sure to extend its popularity and use beyond what would have been otherwise. The framework now includes an additional interface very different from the physical bumps on the blocks: a radio link to a computer, and a specification for downloading codes into a construction's microprocessor controller. In subsequent essays we will explore how a framework/module architecture and these ten design principles can be used to create highly response-able systems, and agile enterprise. We will see that such systems and enterprises are composed of loosely-coupled components whose reuse, reconfiguration, and scalability is both constrained and enabled by the framework that binds them.